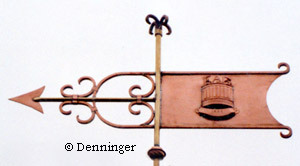 The Westervelt Co. in New York City (1883-1890) was in business for a comparatively short time, but records show they had a considerable weather vane trade, along with other ornamental metalwork. Here we honor this American company with a simple yet substantial banner that carries any logo well. The photo on right shows the Westervelt Banner with a sculpted logo (on both sides) and hand forged scrollwork for a private home in Lockport, NY. Solid brass and stainless steel rod. Installation may vary with each building. 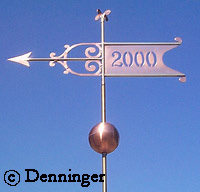 It is very important to us that you are able to properly mount your weathervane so you can enjoy it for many years to come; so please contact us for advice before you order. See our Mounting Diagrams for more options. Prepare your roof ahead with this headblock and brace system, for an easy and very secure mount. This mount is suitable for any size weather vane. Our basic 28 1/2" brass rod allows for at least 8" - 9"of rod inside the roof, and 16" - 20" of rod exposed above the apex of the roof. A nail is used to pin the rod to the brace. Larger sized vanes will need proportionally heavier and longer rods. 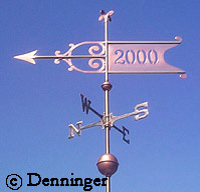 Denninger weather vanes are created one-at-a-time. We are able to customize our designs to reflect each customer's individuality. 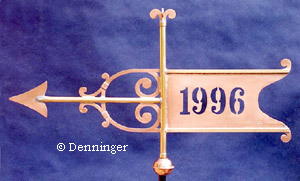 and is handmade, signed and dated by the artist Alfred H. Denninger.